Recordings in the past weren’t always done in DAWs. Before the digital age, records were produced in studios using large consoles and were recorded using tape. But as technology became more and more efficient, studios started using DAW’S as a replacement instead of using tape. Today, the DAW (Digital Audio Workstation) is the core product that drives a home studio or even a project studio. If you’re just starting out, finding a good DAW may be difficult and challenging. Switching from a DAW to another in near future, just because you didn’t like it using it, will not only cost you money but your time too. Here’s the truth. Each DAW has their pros and cons. Some may be better for electronic music producing and the other better for mixing & mastering. Your computer setup for music production matters too. Without an optimized setup, your DAW may not run as smoothly as you want it to be, e.g. : Plugins do not work, you get pops & clicks when recording or worse, crashes when producing. Lucky for you, this post will help you choose a DAW that suits your music making style, plus I’ve added some additional pointers on optimizing your computer for music production. What Makes A DAW Good? A film composer or hip-hop producer might find certain DAWs more appealing. The film composer might want a DAW that has a built-in music sheet editor. The hip-hop producer wants a DAW that allows him/her to slice & loop audio samples quickly. So different DAWs may have their own unique features, but what defines a ‘good’ DAW? You may disagree with some of the points here, but here’s what we feel are important. It’s definitely a plus point to get a DAW that is available to both OS platforms. Why? It’s easier for collaboration to happen – with anyone who uses the same DAW, be able to access or edit your session in their chosen OS, usually Windows or Mac. Most DAW manufacturers are going into the rush to support both OS, but just be careful to choose a DAW that supports both OSs equally well. This one is a hard one unless you can get your hands on a demo. However, CPU stability is one of the most important things you’ll need from a DAW. The last thing you want is your DAW crashing on you during a recording session. Here’s the thing, sometimes the bigger and more complexed DAWs, are the ones that cause stability issues. Do you actually really need all the features in a DAW? Trust me, you’ll hardly find a producer that has used every single feature, plugin or effect in a given DAW. Also, computer OSs are getting updated so quickly that DAW manufacturers have to constantly push out updates. So if you’re choosing a DAW, make sure to see if the manufacturer constantly pushes out updates to address compatibility issues. Bigger industry standard DAWs normally take this very seriously. I prefer DAWs that runs without dongles. This is usually not an issue for music producers who produce on desktop computers – with dongles stuck to their desktops all the time. But for traveling music producers, the tendency to lose or misplace dongles is a risk. I’m usually quite a careful person, but there have been occasions where I wasn’t able to make music while traveling as I mistakenly left my Cubase dongle at the studio. And let’s not even mention the scares I get from time to time. Besides, with computer manufacturers like Apple cutting out ports on their laptops, who still wants dongles? This again is subjective and while I understand dongles are protecting the industry from piracy, I think you’ll agree that we all can do better without them. Are you producing music just for some little fun or are you looking to build a career around it? If you’re like most of us, who takes it seriously, you’ll want a DAW that offers scalability. Can you go for the next 8 years using the same DAW? Or do you see yourself switching DAW softwares as you progress in your music career? Do yourself a favor and start right with an industry standard DAW, you see yourself using for the years to come. Does the DAW accept 3rd party plugins? Does it integrate well with hardware and other softwares? What about mobile support? Unless you’re just planning to make music as a small-time hobby, an easy to use DAW should be adequate. Should I Get A Free Or Paid DAW? When starting out, it may be reasonable to find a free DAW, so you get to test it before purchasing. In fact, most DAWs today offers either a free demo or a light version that you can try, in hopes you get addicted to them and want to buy the full version. But why bother with a free DAW anyway? Coming from experience, using a free ‘limited-feature’ DAW can potentially help you understand your music production style. If you are totally new to music production. I strongly suggest you NOT to buy one yet. Instead, get a free DAW and practice composing and producing it. It’s usually upon trying a DAW, you find your style of music making, then determining the type of DAW that suits you. But other than that what actually separates a free DAW from paid DAW? Usually, a free DAW will have limited plugins and lacks the support to add in 3rd party plugins. They sometimes also comes with limited track limits and reduced support for advanced editing techniques such as automation. However, instead of seeing it as a handicap, having limitations, can give your creativity a huge boost. Use a free DAW like Magix Music Maker (not an industry standard), and attempt to make some decent sounding music. Once you’re done, post links to your masterpiece in the comment section below. We’ll reward you by sharing your music & profile with our readers. Here are some DAW softwares (with their links) that you can try. Apple Garageband is known as the little brother to Logic Pro, which I will talk a little more about later. If you own a Mac computer, skip the rest and just use Garageband. It’s seriously one of the best free DAWs you can put your hands on. The one biggest problem with Garageband is that it’s only for Mac users. Windows users will not be able to use it, unless, you have a Hackintosh computer system, but let’s not go there. Other than that, there’s nothing bad to say about Garageband. Heck, the project files also work in Logic Pro, if you plan to upgrade later on. It comes with a fair amount of virtual instruments and drum loops. There are also many essential effects available too, such as electric guitar amplifier simulations, EQs, reverb, compressions – in fact, great to finish a music piece, ready for commercial broadcast. Take my word, no free DAW comes as close to Garageband with its features & functionality. If you have a MacBook or an iMac and want to get started in recording & music production, its a no brainer. A wide variety of virtual instruments. May have limited features compared to other DAW’s. Garageband comes free as a download in the Mac App Store. And here’s a Garageband course worth enrolling for. Studio One is a DAW by Presonus, a pioneer in hardware mixers, effects, and pre-amps. Presonus’ move towards building Studio One, a DAW software to complement their studio hardware was a smart one. Studio One Prime, a free version of Studio One was released early August 2015 to help beginners and students, experience recording and producing on a DAW. Great for aspiring singer-songwriters, film scorers and beat makers who are getting started. Studio One Prime may seem like the best free DAW in the market but compared to Garageband, Studio One Prime possesses very limited features. Studio One Prime may seem like the best free DAW in the market but compared to Garageband, Studio One Prime possesses very limited features. So compared to Garageband, you’ll find very limited features – you don’t get as many VSTs or virtual instruments to play around with. However that said, it still gives you the ability to record, mix and compose music. And that should do for the aspiring singer-songwriter, film scorer or beat maker that you are. Studio One Prime is not for everyone but if you are just starting, may be something you want to look into. Use it to understand your production style. Electronic music producers might find software limiting. Go full version instead. Studio One Prime can be downloaded at Studio One’s website for free. Pro Tools First is something like Studio One Prime. Bundled down near the same as Studio One Prime, it’s limited in many ways but good enough for your first recordings. Stripped down with limited tracks available and limited VSTs, we see it as a software for people who want to give Pro Tools a try. Pro Tools may be an industry standard, but if you’ve not used it before, note that the learning curve on Pro Tools is also steeper compared to other DAWs. That means you’ll have to give yourself some time to understand and learn the software. Pro Tools may be an industry standard, but if you’ve not used it before, note that the learning curve on Pro Tools is also steeper compared to other DAWs. That means you’ll have to give yourself some time to understand and learn the software. Also, some composers have found Pro Tools to be less inspiring compared to other DAWs like Cubase or Logic Pro. On the upside, whether you’re a beat-maker or singer-songwriter, starting out with Pro Tools means you’ll be geared towards using the industry standard DAW. One more thing to note is that while Pro Tools First does not need an iLok dongle to run, the other versions will require the iLok dongle to run, that is if you choose to upgrade to the full version of Pro Tools. Great for people who want to start using Pro Tools. The industry standard in many commercial studios. Does not need an iLok dongle. Potential expensive upgrades needed in future. Download Pro Tools First from the official website. Known as the industry-standard DAW, Pro Tools is very popular among many producers. Why you ask? Well, simply because many known studios have been using it to the point that it became standardized. But that does not mean, in any way, Pro Tools is the best DAW and should be used by all. It really boils down to preferences and function. With solid effects and mixing tools under the hood, Pro Tools is usually used for serious mixing and mastering work for broadcast-level productions. While it also supports good MIDI capabilities for MIDI composition, Pro Tools falls a little short when it comes to being creative with your sound and MIDI composing with the lack of the more advanced MIDI tools. There aren’t too many nice stock instrument VSTs in Pro Tools and it’s a tad tougher to play around with sounds, such as working on looping, slicing and dicing audio samples. As the market became more competitive, Pro Tools began to become more ‘user-friendly’. Back then, you’ll need specific audio hardware to run Pro Tools. But today, Pro Tools work with most audio interfaces in the market and also runs on both Windows & Mac. There are different versions of Pro Tools. Pro Tools First is the ‘free’ one as mentioned earlier. We then have Pro Tools, the full version, and there is Pro Tools HD which is their version that comes with an HD Core System. Pro Tools is one of the priciest DAW in the market, starting at $499 and $2499 for Pro Tools HD. Interestingly, with the growing subscription market we live in, Pro Tools also offers subscription plans to their software from as low as $24.92 per month. You’ll have to use a dongle iLok is used to run Pro Tools. The program cannot run without it. Most studios use this program. Can be pretty buggy on Windows. Needs an iLok dongle to use the program. Pro Tools First – the freebie. Pro Tools 12 – the full version that also comes included if you buy the Avid audio interfaces or the Avid Eleven Rack. Pro Tools HD 12 – the ultimate version of Pro Tools. Don’t go for this unless you’re opening a huge commercial recording studio. Logic Pro is a popular DAW for Mac users. What makes Logic Pro so desirable is that it is one of the ‘most complete’ DAW in the market. Straight out of the box, you get effects, plugins, VSTs, instruments and world-class tools that enable you to finish commercial ready music tracks, without having to purchase any extra plugins. In fact, there is an optional 51GB download, worth of sound & audio content. Logic Pro is popular among film scorers, hip-hop, pop & rock producers, thanks to its intuitive UI and editing features. You can do anything you want in a DAW, from chopping up samples, resampling them, fixing vocal pitches, mixing, mastering or analyzing and printing music sheets – all from a single software. To further add on to more possibilities, there are few accompanying apps you can download to use with Logic Pro. Logic Remote, is an app that works on your iPad, acting as a ‘ wireless remote’ to control things such as your plugin knobs, mixing faders, transport controls and even playing instruments. Imagine being able to hit record and stop from the recording room using Logic Remote. We think that’s an untapped advantage of Logic Pro. MainStage, another app, will appeal more towards music producers who perform on stage as well. With Mainstage, you basically turn your Mac, together with Logic Pro, into a live rig with ready sounds and instruments for performing on stage. Where Logic Pro really falls flat is it doesn’t run on a Windows machine. And while it pretty much covers everything a typical music producer would want in a DAW, some producers have found that it takes more steps to complete certain tasks, such as automating pitches or tweaking audio files, as compared to doing it in a DAW like Ableton Live. Fun fact: Logic wasn’t always a MacOS only software. It was compatible with Windows until Apple bought over the company (Emagic) and now only MacOS supports Logic. Easy to use & smooth learning curve. Logic Pro is available on App Store as a $199 download on your Mac. 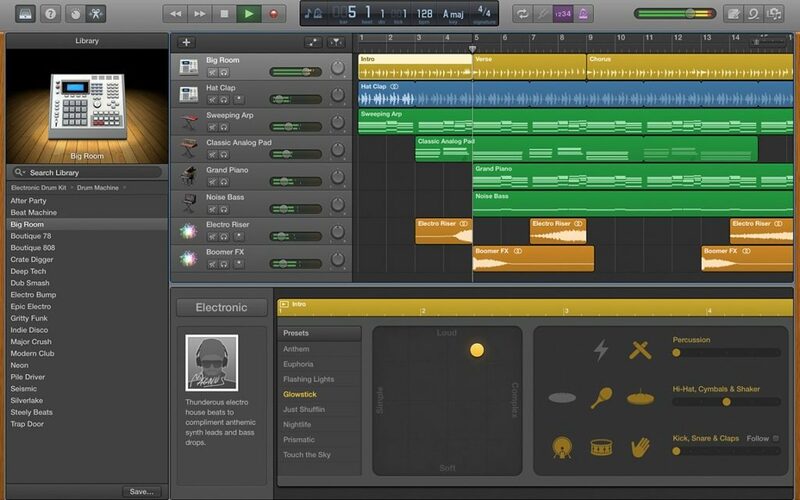 Get started with Logic Pro with this top-rated course on Udemy. Steinberg has been in the pro audio market for a long time. Cubase was released in 1989 and during that time, MIDI was the only feature available in Cubase. Later on, in 1992, they added features to support audio and made it compatible with Windows. Because of that, you can guess that Cubase is a DAW with one the most advanced MIDI editing tools. Other than just simple quantization or swing function, in Cubase you could do serious advanced MIDI editing such as velocity compression, adaptive/rhythm quantization to note expressions and much more. A well known, all-you-can-do DAW for Windows & Mac, Cubase has also earned a reputation among many producers, such as Hanz Zimmer, Zedd, Tiësto and so on. Just like Logic Pro, you also have an option to purchase a companion tablet app, known as Cubasis, for recording, editing and mixing on the iPad. Files from the Cubasis are easily transferable to Cubase on your desktop. Downside? Cubasis costs $49. Just like Pro Tools, Cubase also uses a USB dongle to secure its licensing and authenticity. Take note that it’s not an iLok but rather their own version of it, called the e-licenser dongle. If you purchase one of Steinberg’s interfaces, for example, the Steinberg UR22, you will receive a version of Cubase known as Cubase Ai. This is a ‘free’ version of the DAW but comes with more features, compared to many other free DAWs in the market. Has been in the market for a long time. Extremely stable & rarely crashes. Has many world-class stock plugins. Takes some time to understand complex workflow. Cubase Elements – the ‘starter’ version of them all but usable. Cubase Artist – suitable for singer-songwriters who wants a little bit more. Cubase Pro – for professionals or enthusiasts who produce music seriously. Studio One has been fairly new to the market. Unlike the industry-heavy DAWs like Cubase or Logic Pro, Studio One has been in the market for just slightly over 7 years. The main selling factor in Studio One is how it features efficient and quick music making. They do this by enabling drag & drop features, so you could simply drag an instrument or an effect into the arrangement window and start recording away. While Studio One started off feeling a little buggy, a lot of improvements has been made over the past years to make things easier and better for producers. Studio One has always been about making their DAW seem less technical for musicians. We’d say Studio One is a great software definitely worth looking at for beatmakers, film scorers, audio mixing, singer-songwriters and anything else you may do with music. If you like to try it out first, Studio One Artist, a limited version comes included with any PreSonus audio interfaces or audio hardware. Easy to use and helps creativity workflow. Can be a little buggy (CPU spikes, freezes, etc.) Stay updated. Studio One Prime – the Pro Tools First competitor (it’s free). Studio One 3 Artist – for aspiring singer-songwriters. Studio One 3 Professional – for professionals or enthusiasts who just wants the best. Cakewalk Sonar is sometimes known as the Logic Pro for Windows because it used to be Windows supported only. But as of lately, Sonar was released on MacOS and now it’s compatible with both operating systems. Just like Cubase or Studio One, Sonar is a diverse DAW that can do pretty much everything. Not exactly popular among modern music producers, perhaps due to its old-fashioned graphic interface, the plus point is that it is insanely affordable, therefore, good for aspiring producers who want to get started in producing and recording, without spending too much. While the software has gone through some iterations and now actually very usable, some producers have found the software difficult to navigate around and to understand. And while Sonar has been really stepping up their game in making their product much better for users such as providing more VST’s or plugins, the audio content that comes bundled with it hardly beats the quality or quantity you get with a DAW like Logic Pro. And while Sonar has been stepping up their game in making their product much better, such as providing more VST’s or plugins, the audio content that comes bundled with it hardly beats the quality or quantity you get with a DAW like Logic Pro. However, on the upside, unbeknownst to many aspiring producers, the effect plugins in Sonar sounds really good, just like Sonar’s own modeled version of the LA-2A, a very popular and re-known vintage compressor that costs over $3,400! We usually see rock & band producers using Sonar for recording & mixing, but it’s intuitive for other types of producers as well. Perhaps not so much for electronic music producers, as there are fewer tools dedicated to tweaking sounds & samples in Sonar. It is affordable and easy to use. Great for recording & mixing. The user interface is quite messy. Not so user-friendly for electronic music making. Sonar Home Studio – entry version at $49 only. Sonar Artist – great for aspiring singer-songwriters who want to get started. Sonar Professional – for producers who want to record & mix commercially. Sonar Platinum – the total package, Basically, it’s everything. 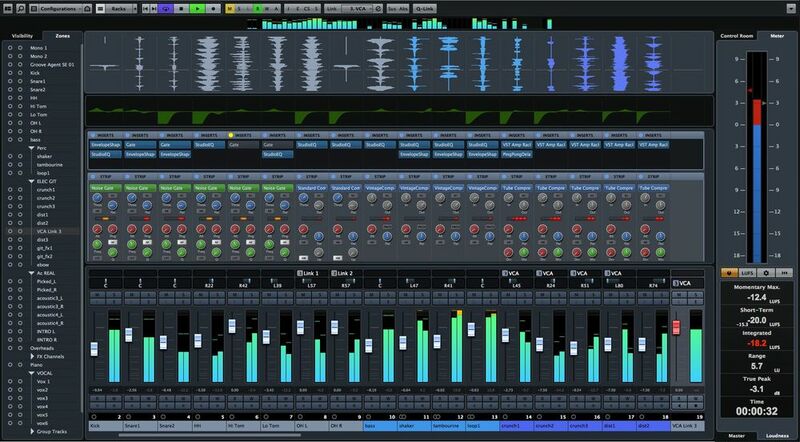 If you have been scouring the internet in search for a reasonably priced DAW, you might have heard the DAW called Reaper. This DAW is the answer for people who want product quality to money ratio. It gives you 60 days of evaluation free, with full functionality and all the features and if you like it, you can buy it. What more can you ask for? Just like Cubase, Cakewalk Sonar or Studio One, Reaper can do many things – from beat making to film scoring to songwriting, but all of that for a more reasonable price. While we’ve mentioned that Cubase is stable, Reaper DAW software is stabler, using only very minimal computer processing resources to run. This means you can even run Reaper on older computer systems and make it work for you without a worry. Built to be efficient, lightweight but feature filled, there is little to no lag even with lots of effects and plugins loaded in the software. Advanced MIDI editing and multitrack recording are also possible on the DAW. And as of lately, version 5 also comes built in with a score editor, which would be ideal if you’re looking to edit and print score sheets. Reaper is also very customizable. If looks are what drives you to do what you do, you’ll love Reaper. They even have downloadable skins on their website to make Reaper look like another DAW. The cons to Reaper is that the plugins and effects that come bundled with it might not be as solid as the plugins you’ll find in other DAWs. A workaround is to purchase 3rd party instruments and plugins to use within Reaper. Customizable UI skins for the DAW. Standard boring layout (make sure to customize it.). Requires some learning and getting used to. You probably want to use 3rd party plugins on top of it. Reaper offers a 60-day evaluation. Go try it out. Ableton Live is popular among DJ’s, beat makers and electronic producers because it does really well with live performances. You often see artists, triggering samples on stage, for example, one-man artists such as Ed Sheeran, controlling loops & samples via Ableton. Its primary use is for live performances and while it succeeds to do that, through the years, the program has evolved into a complete recording package with included loops, virtual instruments, and effects. 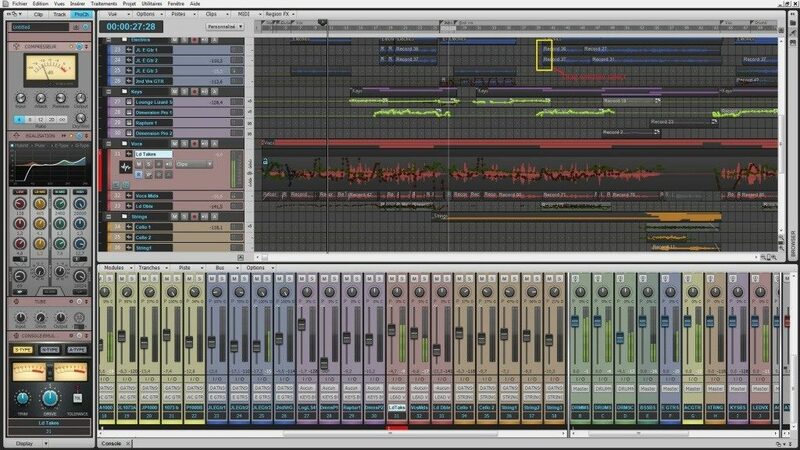 Beatmakers love Ableton Live because when creating beats, it is simple and efficient. When tracks with different BPM(Beats Per Minute) are added to the session, it immediately changes the BPM to match the session. If you’re an electronic music producer, you’ll love how easy it is to quickly add effects and immediately tweak the sounds, such as changing its pitch, creating crazy automation and doing any type of audio slicing & dicing. The only other DAWs that comes close to how easy it is to tweak sounds is BitWig Studio – which again, looks like it’s modeled after Ableton Live. Ableton Live Lite comes included if you buy Ableton products such as the popular Ableton Push or if you purchase a Focusrite audio interface. Very quick sound sample editing, slicing, and tweaking. Different working layout compared to conventional linear based DAWs. Live 9 Intro – essentials for an affordable price of $99. Live 9 Standard – standard package to make serious music. FL Studio is a Windows only DAW. There is also a Mac version ready, but only in Alpha version and has been reported to be quite buggy. It is most popular for electronic music making and contains a wide range of virtual instruments. FL Studio is amazing at recording virtually but not so good with audio recording. This is partly due to their latency engine, but if you are just looking to produce with virtual instruments, FL Studio does great. Its editing features are made with the electronic, mobile producer in mind. That is, if you only have an audio interface, a pair of studio headphones and a mouse, you are in fact already set to go with FL Studio. FL Studio also excels with automation when it comes to messing around with electronic sounds. If you see yourself producing electronic music and doing lots of automations, you’ll find FL Studio great. Another thing about FL Studio is that it provides lifetime updates upon a single purchase. That my friend, is very welcomed! Great for beat making, loop-based compositions & generally electronic music production. You can get away using mouse clicks. You don’t even need a MIDI controller. One of the best DAWs to do crazy automations. Favored by die-hard electronic producers, like Skrillex. FL Studio is a must try for electronic producers. If you are looking into producing electronic or hip-hop music, Propellerhead Reason may just be the DAW for you. This is a very stable DAW with many features. The “reason” why this DAW is great for producing electronic music is its suite of virtual instruments. The range of analog sounding synths attracts many hip-hop producers. Instead of having to buy 3rd party virtual instruments, Reason already has enough solid sounding virtual instruments to help you make the next best hit. Another great feature of Reason is the ability to collaborate with producers without the need to switch DAWs. Propellerhead’s integrated software known as Rewire helps you integrate into other DAWs and audio softwares in your computer. Reason used to not support 3rd party VST plugin integration. However, as of Reason 9.5, the support to add in 3rd party VST plugins has been added. However, our audio editing experience on Reason has been pretty sour. You can’t depend on Reason for any serious audio editing work and I’d suggest getting a dedicated audio software like Adobe Audition or the free Audacity, if you’re going to go with Reason as your main DAW. The latest Reason DAW runs on both Windows & Mac. Many analog based virtual instruments. Reason 9.5 Essentials – the “essentials that you will need”. Reason 9.5 – the total package. Firstly, there is NOTHING wrong using Windows or Mac to produce music. If you’re still contemplating between the two OSs, then read our earlier post on whether to go Mac or PC for music production. However here are 2 quick thoughts I’d like to leave you with when it comes to your computer for music production. I’d always advise keeping an eye out for upgradeability when building or choosing a computer system to make music on. Faster hard disks mean you write and transfer data faster, so you experience fewer pops, clicks when recording and your DAW will generally load samples and boot faster. More RAM, on the other hand, will give you the ability to load more effects, plugins at one go. Virtual instruments take up lots of RAM, so you want to have as much RAM as you can afford in your computer system. No matter which DAW you choose, your recording or arranging workflow will be snappier with more RAM and faster hard disks (SSD recommended) installed. Also, some DAWs like Cubase are able to make use of your graphic card’s processing power to help with the processing effects and more. Again, no rights or wrongs here. But I know this question gets asked a lot, so let’s be honest here. If you want value for money, get a desktop. You’ll lose mobility and only be confined to a room to make music. Not exactly how I get inspiration but this setup works for many producers. You also work with better ergonomics. If you want better inspiration & mobility, get a laptop. I found myself to get more inspiration by being able to switch my working environments whenever I need them. You do this, however, at the expense of losing processing power and upgradeability – which oddly enough, I’m okay with. Well, maybe not so much if you work with giant orchestral productions and need 100+ tracks going in your DAW. And oh, let’s forget making music on an iPad, unless you’re a 9-year kid trying to look geeky. Who makes serious music on a iPad anyway? I hope this post will help you make better DAW purchasing choices and think a little more about your music production career. Remember, never choose your DAW by looking at your favorite producers. It may seem beneficial to them, but it may be different for you. If I were to give Skrillex or Hans Zimmer a laptop equipped with a standard DAW and you, with the state-of-the-art computer system, best MIDI controller, top-end studio monitor, $1000 plugins, and headphones. Who do you think will make better music? It’s the years of experience, not the DAW or the hardware, duh! So focus on improving your skills instead. Choose a DAW and quickly move on to the next thing. There may be certain DAWs that I may have missed out above. Which DAW are you using and which do you think is best for a beginner or for the professional? Leave a comment down below and let me know. Show Fools is so overrated. Has the less cohenrent routing systems. The stock plugins are the perfect excuse to solely use third party plugins. Most professional engineers sticly use it as virtual tape-machines, and the ease of comping amateur 160 tracks mixes for a 2gt,1Lgt,1Bss,1Lv and its dbl or 1bv, and ?Drm ! It’s overpriced. Some complains about the no commited tracking allowed (Show Fools is a dry DAW). And, why is Show Fools so proud of being the ugliest by fear of customization, for Show Fools doubts in AUDIO-mixing-engineers capacities in COLOR-mixing, and re-organizing the global workspace (resizing,moving,hiding and detaching parts to only be seen on one of 4 monitor-screens).and where is the control room ? Pretendus Burrito 3 will self-discontinued itself next, since Sonar died, and Steinberg shall prevail, for a BMW-DAW is simply more than DAW : It’s a raw-powered way of living ! Show Fools Cadillac is boring way of dying by AAX !! SSL to you all and happy next sun orbiting duration.